11 years ago today, 56 people (including the perpetrators) lost their lives in the July 7 London bombings, but is public security really under control in the UK and in London specifically? Mayor of London Sadiq Khan, has pledged to do "everything possible" to prevent a tragedy like the July 7 attacks from ever happening again, but how secure is London 11 years after it has suffered one of its worst terrorist attacks? ​Dr David Lowe, from Liverpool John Moores University believes that London is in much better shape than it was back in 2005 when the attacks took place, however he stressed that there is always room for improvement. "We have made significant improvements; the first was making closer arrangements with MI5 potential, also establishing better networks, so that information is being passed over to the police. Before 2005, MI6 and MI5 hardly spoke, now they communicate a lot in regards to terrorism," Dr Lowe told Sputnik. However, Dr Lowe said that there is always room for improvement and London should still maintain a "on your guard" mentality due to terrorist organizations such as Daesh — also known as ISIL. "I think when you look at the threats we are facing now with Daesh and the horrendous attack in Iraq, Turkey and Saudi Arabia, you are looking at a group like ISIS [Daesh] losing its territory and we are seeing a response from them that is to be expected and it's an international threat. So let's ensure our intelligence [of a potential] threat is effective. In the UK we are pretty good at what we do and I know the cooperation we have with France and the States is good," Dr David Lowe said. Flowers from British Prime Minister David Cameron are displayed at the memorial to the victims of the July 7, 2005 London bombings, in Hyde Park, London. But is the threat to London really over? Well this will never be the case as long as terrorist organizations like Daesh and Al-Qaeda exist. The UK threat level remains extremely high at 3, so the threat is ever present. So can 7/7 happen again? "Yes it can. London is a target, the UK is a target and you look where the greater risk is and where a cell could exist and the number one target would be London. The reason is because security is higher and this would benefit them [terrorists] if they attacked and it [the attack] was successful. "Police need to be looking at soft targets: so sports events, stadiums, festivals, restaurants. So, yes it is a possibility and even, Andrew Parker, head of the MI5 said last year there were eight attacks prevented in the UK and some say that's not many, but it is." "It is virtually impossible to prevent every attack. I know that my colleagues are stretched and a lot of hard work has gone in and we always have to look at the possibility of another attack, that is why we are at threat level 3," Dr Lowe told Sputnik. But how will Britain leaving the EU impact security? There have been various claims that our risk of a terrorist attack will increase once we are no longer part of the union. Dr Lowe believes the fact we will not be connected to Europol will impact us greatly, considering we helped shape it. ​"We are safe in the UK; also we are still going to be [part of the EU] for the next couple of years. We were running Europol, we shaped it to what it is now. Yes we will still be dealing with Europol, but not making decisions." The 7 July bombings not only changed the way London operated, but it impacted the whole country. 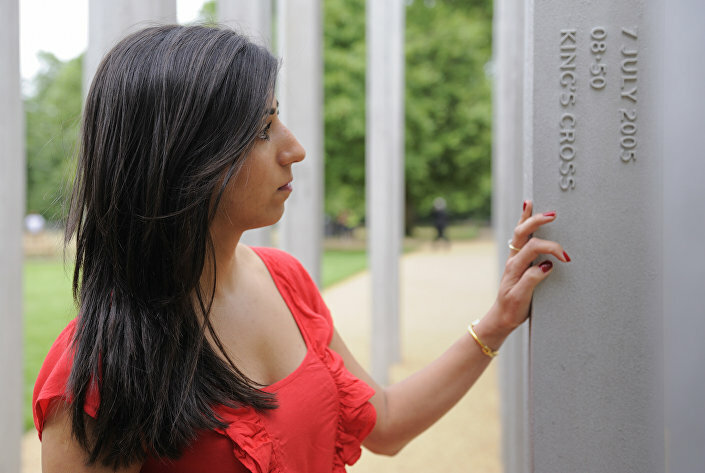 Saba Mozakka, whose mother Behnaz Mozakka was killed in the London terrorist attacks on July 7, 2005, places her hand on a memorial dedicated to the London Bombing victims, in Hyde Park, central London, on July 6, 2009. We all remember the images of the double decker bus with its roof blown off, as well as the chaos at London underground stations throughout the capital. Fear was rampant for many years after this, and with the security threats and attacks taking place throughout the world, some think it is only a matter of time before London is hit once again. However, for today at least we can remember the victims who lost their lives in those terrible attacks and the heroes who risked theirs to help save others.